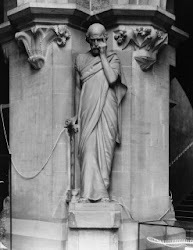 On BlogCatalog, the directory to which I've submitted Channeling Hippocrates, there is an interesting discussion unfolding about fear's role in motivating people's behavior. The discussion's moderator asked if we thought the world would be a better place if people took more risks and trusted their instincts more often, what obstacles prevent people from overcoming their fears, and how we personally manage our own fears. Although most responders acknowledged that fear is an accomplished motivator, there were varying levels of disagreement about whether or not it's an instinct, and just exactly what it accomplishes. Here is how I responded: "If, by trusting one's instincts, you are referring to being guided by intuition, then, yes, I think the world would be a freer, happier place if we dared to trust our inner voice. We'd be more attuned to the universal consciousness, which is where real insight is gained: in truly "knowing" ourselves, we'd see past our egos, the seat of fear, hostility, and ignorance, and we'd come to know each other. I think much of people's behavior is fear-based; it's about defending that precious ego and all of its attachments, under the false assumption that everyone else is out to get you somehow...this is what I believe to be the major obstacle people have in overcoming fear. You see and experience its nasty results every day: in grocery store lines, on the freeway, inside hospitals and businesses. In a fear-based existence, people tend to react to situations with absolutely no thought given to outcomes or other points of view. When they dominate by using whatever force or manipulation their egos dictate, they feel like they've "won", but they've only generated more fear and misunderstanding, making the situation worse for themselves and everyone else. How do I handle my fears? I learned long ago that, in my life, "never say never" holds true. I've taken a lot of life-altering risks, mostly guided by intuition, and I can say that when I listen to my instincts/intuition, I've never regretted any of the decisions I've made. The risks I've taken haven't always turned out the way I expected, but I have learned something from each of them, and have grown in some way as a result." Yesterday, Spartacus and I went to Sears to get a water filter replacement cartridge for our Kenmore refrigerator. When we moved into our new loft a little over a week ago, we noticed that the ice maker wasn't making much ice, and the ice it did make was hollow. The water flow from the dispenser was also very slow, taking nearly a minute to fill a 12 ounce glass. This kind of thing drives me crazy, because I know it's usually a pretty easy fix. After being a DIY homeowner for so many years, it's hard to get used to the idea of calling a landlord to fix every little problem. Being able to "fix" things involves either a certain level of confidence or stupidity, depending on the task, and whether or not you are willing to jump through the diagnostic and troubleshooting hoops to accurately narrow down the etiology of your appliance's problem. You also cannot be afraid of managing electricity and plumbing; you have to approach these entities rationally, with great attention paid to common sense and safety. I Googled "Kenmore ice maker troubleshooting" and found a youtube video which demonstrated a simple way to determine if the problem was the ice maker or a malfunctioning water inlet valve. You unfold a paper clip in a "U" shape, wrap some electrical tape around its midsection, remove the cover from the ice maker, and then, use the paper clip to temporarily jump the connection between the water inlet valve mechanism and the ice maker. If water flows into the ice maker, but it still doesn't make ice, the problem is a bad ice maker. In jumping the connection, I could see water immediately flowing into the ice maker. Since our ice maker was making some ice, it didn't seem like the problem was rooted in the ice maker itself. Because the water flowing through the door dispenser was so slow, I Googled that issue, too, and learned that low flow could be as simple as a clogged water filter or low water pressure, or as complicated as a malfunctioning water regulation valve. Looking at the filter, I couldn't tell when it had last been changed. The owner of this place did not seem to be particularly handy, as evidenced by the rotting caulk in the bathroom tub (which, BTW, I properly recaulked myself this weekend) so, assuming she had probably never bothered (or didn't know how) to change it, I went ahead and removed it. This intervention was like magic! Water from the dispenser now flowed into my glass like the Mississippi River. A couple of hours later, I could hear the glorious sound of ice tumbling into the freezer's ice bin, so I knew we just needed to replace the filter: an easy $40 fix. After a late afternoon workout, Spartacus and I proceeded to Sears, which is the only place in town that you can buy replacement cartridges for Kenmore appliances. There is a Lowe's within 5 minutes of here, but they only sell filters for GE, Whirlpool, Samsung, and LG refrigerators. The closest Sears store was at Northlake Mall, over near my old house, about a fifteen-minute drive from Kirkwood. I'd already verified online that the Northlake Sears had the filter cartridge in stock, and since it was 4:35 p.m., I had also checked to make sure the store stayed open until closer to 6 p.m. We were both ravenously hungry after working out, so our plan was to pop in, buy the filter, and then, head down to Napoleon's at Oak Grove for a very late lunch. After locating the filter, we went to the closest check out station to complete our purchase. Upon approaching the station, we noticed a couple of ladies and a teenage boy standing several feet away, hanging out near the area with an empty baby carriage. They appeared to be together. They didn't have any items in hand, and seemed to be waiting for someone else to join them. The lady manning the check out station was talking with another employee; they were troubleshooting something on her computerized cash register. Because it was unclear whether or not the station was even open, I asked, "Can we check out here?" The lady behind the counter said, "Yes, just give me a minute." With that, I placed the cartridge on the desk, and we waited. The people next to us, the ones with the baby carriage, didn't say a word until the lady got her computer problem resolved. She simultaneously picked up the cartridge, asking them if they needed any help. At this point, it was clear from the looks on these people's faces that they were pissed...at us! They indicated that they wanted to buy "this here microwave", pointing at a discounted floor-model oven that was sitting on a cart near the desk, admonishing, "We were here first." Because our purchase was straightforward, the check out lady asked them if they'd mind if she first completed our transaction. The only way I can describe the visage and posturing of the group's spokeswoman is that unpleasant, yet all too familiar, passive-aggressive-arms-folded-who-the-hell-do-you-think-you-are? kind of attitude which one commonly experiences in check out lanes at the supermarket. Although it should have been obvious to these people that, for whatever reason, we didn't realize they were standing in line, they hadn't bothered to say a word to us, until now. It's interesting how their body language and demeanor changed from disorganized milling around to aggressive and confrontational the moment the lady behind the counter looked up. I guess we were supposed to have assumed that they were checking out, too. This is where a simple, "We've been waiting here to buy this microwave for quite a while now; you may want to go to another register" would have been so helpful. While I concede that Spartacus and I may have committed an error in observation, these people were looking for a fight. Indeed, they weren't just standing in line, they were staking out what they considered to be "their" territory, their crossed arms, pursed lips, and unilaterally raised eyebrows defiantly challenging us to do battle with their egoistic illusion of "me" and "mine." How utterly ridiculous! The tension amongst them palpable, I glanced at them, then turned to the lady behind the counter, and asked, "Is there somewhere else we can check out?" She directed us near where we had entered the store, and said there was another register on our way out. Within moments, Spartacus and I were walking out of the store, new water filter in hand, ready to chow down on some pub grub. In choosing to take the path of least resistance, we not only successfully averted conflict, we undermined the egos of our "competitors" by not allowing them to indulge in a fear-based assault. I actually feel sorry for people like this; they seem to have such a tenuous grip on reality, and fighting back is the only way they feel they can hang on. When we forget that we are "all One", we start thinking in terms of "me and mine; you and yours." We view the world as a hostile place, full of people with bad intentions. Because we are so out of touch with our own consciousness, we become obsessed with protecting our egos and all of our "stuff", engaging in the grand charade of illusion we project to others, fearing all the time that we'll be found out by someone else, or, even worse, by ourselves. I don't think fear is an instinct at all. As babies, we're completely fearless. We first learn to fear things, like snakes and people with different colored skin, from our parents. Later in life, society willingly assists us in cultivating and propagating more fear, relentlessly chipping away at our perfect and pure infantile spirits, until we are hollowed-out shells of our potential selves, just like the ice cubes my freezer made before I replaced the water filter cartridge. Giving in to fear makes life unnecessarily difficult. It causes us to make faulty assumptions, jump to irrational conclusions, and gives us permission to act like jerks. Like Henny Penny, the misinformed chick who believed the world was coming to an end because an acorn fell on her head, fear becomes so ingrained in us that it's difficult to let go, and before we know it, we're catastrophizing even the most minor issues. I think we all could benefit from being like we were as babies, completely without fear or faith. It may sound counter-intuitive, but faith, like any form of expectation, imposes limitations on us, in much the same way as fear does. The worst case scenario is faith which stems from fear, the kind that seems commonplace within all forms of religious and political fanaticism. We don't need to be scared into doing the right things; we need to spend more time, listening to and honoring our intuition. The bad apples in the world are far outnumbered by millions of wonderful, interesting, talented individuals, all of whom contribute to life's ebb and flow. Maybe we should all take more time to seriously consider FDR's observation that "the only thing we have to fear is fear itself." In abandoning our egos, we'd lose the ignorance-breeding fear which prevents us from knowing ourselves and keeps us engaged in conflict with other human beings. In getting rid of our expectations, especially those based in fear, (gasp!) we might actually quit being so afraid of ourselves...and each other. Kris, I completely agree with your view that fear is a learned behavior, not an instinct, though I realize this is not the conventional view. Fear is a habit one acquires like smoking, and it can be overcome through awareness and common sense. You should try rock climbing Kris. Fear of falling is the biggest inhibitor of performance imaginable...although you do need to be aware of the dangers, which is not the same thing. Dennis, I've been curious about those rock climbing walls I see around town. Maybe that would be a good place to start?